The following Frequently Asked Questions to provide you with more information regarding the new Dubuque Community YMCA/YWCA facility. 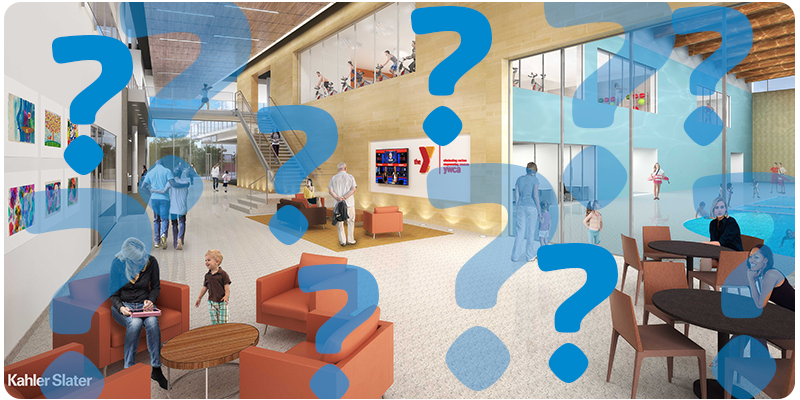 Why was the current location of the Dubuque Community YMCA/YWCA selected for the new facility? After extensive research, surveys and focus groups, it was deemed that the best location for our new facility is on land at our current location at 35 N. Booth Street in Dubuque. Will the current facility remain open during construction? We plan on remaining open as we phase in the new facility. Our goal is to break ground during spring 2019 with the intention of opening the new facility fall 2020. A team of architects are working on the design of our new facility that will be a multipurpose community, health and wellness, and aquatic center for members and nonmembers alike to use. Eventually we will deconstruct the current facility. How has the Y determined what to include in the new facility? We have an extensive market research report that reflects us what members and the community are looking for in programming. In addition, we have conducted several surveys and focus groups that have helped to identify community needs. Will the new Y be for members only? No, as with our current facility the new Dubuque Community YMCA/YWCA will be for everyone. Members are very important and are needed for the Dubuque Y to exist, but the we strive to be a welcoming, inclusive organization for everyone regardless of age, race, ethnicity, religion, sexual orientation, gender identity, disability, marital status or socioeconomic status. Will there be a rate increase when the new Y opens? Our board of directors review membership rates annually. It is the intention of the board not to raise rates the first year of the new facility’s operation. Financial assistance will continue to be available for those in need. Will there be public/community space? Yes, the Dubuque Y is here for all. The new facility will have dedicated meeting space for rent and community meetings. Pricing and availability will be determined nearer to the grand opening. Will the Y continue to offer financial assistance and scholarships? Yes, we are here for all. Financial assistance and scholarships will continue to be available. Will the new facility offer more childcare space? Yes, the new facility will meet a need in the community for qualified childcare by expanding its infant, toddler and afterschool care programs capacity. What are your Community Health Programs? The YMCA’s Community Health Programs are designed to help all community members live their healthiest lives. Living healthy is about spirit, mind and body at every age and stage. We offer several programs for those dealing with chronic disease. Prevent Type 2 Diabetes by participating in the YMCA’s Diabetes Prevention Program. Monitor your blood pressure by participating in the YMCA’s Blood Pressure Self-Monitoring Program. Manage your arthritis by participating in the YMCA’s Enhance®Fitness Program. What is the newest program Restorative Strategies? Restorative Strategies is a volunteer driven program and focuses on providing quality service to youthful offenders, crime victims, and the community. Currently the program is serving 350 youth. What is the Reach and Rise Program? Reach & Rise offers two FREE mentoring programs through the Dubuque Community YMCA/YWCA: individual and group mentoring. Trained adult mentors are matched with youth to help youth improve relationships, self-confidence, sense of belonging, sense of achievement, and increase access and linkage to other services.